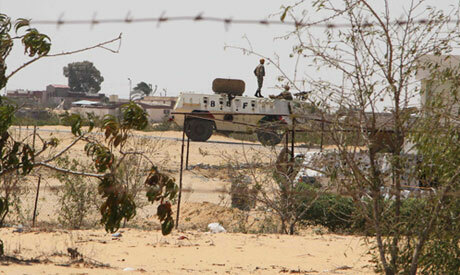 Military prosecutors are questioning 11 men arrested last week after attempting to bomb a military installation in Egypt's North Sinai city of Rafah. Members of the group – which includes six Egyptians, three Palestinians and two Lebanese – were found in possession of automatic weapons, remote-control explosive devices, satellite telephones, and maps of the Sinai Peninsula showing military zones. During questioning, members of the so-called 'New Jihadist' cell said they bore no affiliations to any foreign organisations. Security authorities plan to carry out further investigations to determine the group's affiliations and financers. Since Egypt's 2011 uprising that overthrew autocratic president Hosni Mubarak, the Sinai Peninsula has continued to suffer a security vacuum. Last August, 16 Egyptian soldiers were killed in an attack by gunmen – who were never identified – at a military checkpoint near the Rafah border crossing with the Gaza Strip.